Competitive analysis is a technique for evaluating pros and cons of an individual’s business in terms of comparison to other businesses in the same industry. It is used for analyzing the business market, environment, strengths and weaknesses of the individual’s organizations as well as of the rival’s organizations, customers’ demands, tactics for improving market position, strategies for increasing market share percentage, and obstacles for competitors who wish to secure the individual’s position in the market. 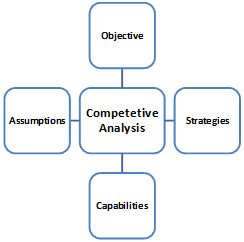 Competitive analysis is widely used by multinational organizations to assess their performance in the market. It can be used to compare few organizations in a detailed manner or many organizations at just the surface. The advantage of this approach is that it is not limited to a specific industry, but can be applied to any organization in any field. The organization gets a deeper insight into the market and can use it effectively for progress. It evaluates the market position so individuals can figure out better organizations than theirs and the reason for their higher reputation in the market. Competitive analysis also sets a standard benchmark, which can be used for calculating efficiency. The main domains to consider when carrying out competitive analysis are shown in the flow chart on the right. The data used for performing competitive analysis can either be qualitative (non – numerical) or quantities (numerical). Both types of data can also be used in a single analysis. The following points are essential for any competitive analysis. The first step is to determine the organizations which are to be included in the analysis. The number can be any. Usually the top three of five organizations in the industry are chosen. If a more formal analysis is required, then figure out the competitors by looking at the market from the customers’ eyes. Arrange the companies according to their rates, considering the quality of the products. The companies can also be grouped on the basis of the strategies which they adopt for acquiring a higher position in the market. Once potential competitors have been evaluated, start analyzing their strategies and identifying their most sensitive areas. This is accomplished through making a thorough study of their strengths and weaknesses. Make note of all the key assets needed in the industry. Figure if the organization incorporates all of them into their products and services or just a few. Determine vital skills needed for success. Again figure out if the competitors have all the skills or is lacking in some of them. There are certain factors which are always negative for any industry. Late orders, customers’ dissatisfaction and low quality products are examples. If any of these are characteristics of an organization, then mark it as its weakness. A company’s market position is directly proportional key assets and skills. An analysis of the top most companies identifies the main reasons behind their progress and reputation. If unsuccessful organizations are also studied side by side, the reasons for their lack of performance can be easily determined. The following four aspects must be analyzed in all cases. The strengths and weaknesses of the company conducting the analysis should also be determined. Figure out the aspects which give it an edge in the market. Determine which products are innovative and which services are unique. The price must be lesser than the market average. The sales team should have a positive aura about them and be ambitious and friendly. It should also not loose morale if targets are not being achieved. The marketing personnel must be extremely creative and think up of original and impressive ideas. The presence of an inventory management system makes it easy to maintain orders. Utilize all the strengths to achieve a better market position. Also find out which factors create a negative impression for the customers. The products, by all means, must not comprise on quality in any way. The price should not be higher than the average market price, and if it is then the quality must be exceptional as well. The marketing campaigns must depict originality. Copied ideas would be bad for the company. The employees must maintain an acceptable atmosphere in the workforce. Grudges and jealousy out in the open would just distract everyone from their duties, and no goals would be accomplished. Try to eliminate the weaknesses at least to a notable extent, if not completely. The wants and needs of the customers should be the foremost priority for any organization. Companies still in their developing phase should adopt the already existing priorities in the market but should not limit themselves to it. Predicting future needs of customers is also of utmost importance, not only for small firms but for big enterprises as well. Think up of new aspects which would be likable by the clients, and become one of their needs in the time to come. An innovation in technology, addition of a different feature, a brand new look or even an inspiring advertising campaign do well in getting attention of the customers. Marketing strategy is the final point to consider in any competitive analysis. After all the analysis and study has been done, incorporate all the information into a plan. The plan should include all aspects of the business such as production, services, prices, quality and marketing. Divide the plan into phases, and step by step, try to accomplish each one. Also determine the minimum and maximum time period, so progress can be evaluated. Set up small goals, and achieve each one to get the bigger picture. 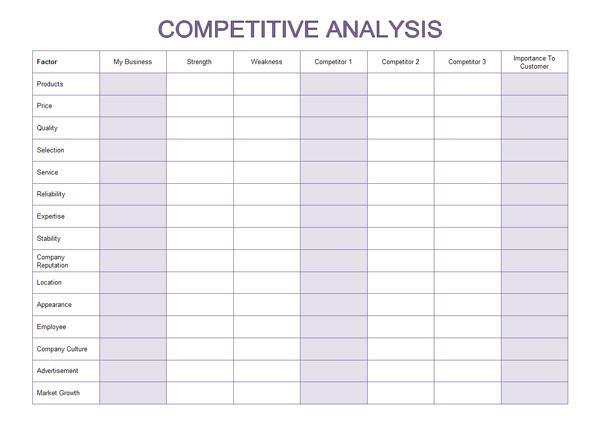 The following table lists all points which are necessary for an effective competitive analysis. It can also serve as an example for carrying out the research. 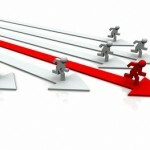 This can really help any organization gain a competitive edge in the long run.